*Contact Us For Sale Pricing! HO-4.2kW (High Output) 3 Rooftop Turbine Wind/Solar, Grid-Tie Complete Kit. HO-2.8kW (High Output) 2 Rooftop Turbine Wind/Solar, Grid-Tie Complete Kit. *Sale prices WITH dealer sales commissions subject to review and arbitrary adjustment. Dealers can either buy at sale price or wholesale dealer price, NOT BOTH. WE7 cannot sell at a Loss. These new small wind generator turbine jobs are popping up in communities all across the US and Canada. The small wind generator turbine kit job turned out to give the local electricians a couple of days of work. This video shows our home wind turbine kit in the ice and snow, heavy winter conditions. Like all other conditions, our sturdy all-weater systems hold up to any weather and just keep making green energy for your home. As shown in the home wind turbine video, these home wind turbine kits keep spinning in heavy snow and ice during winter. 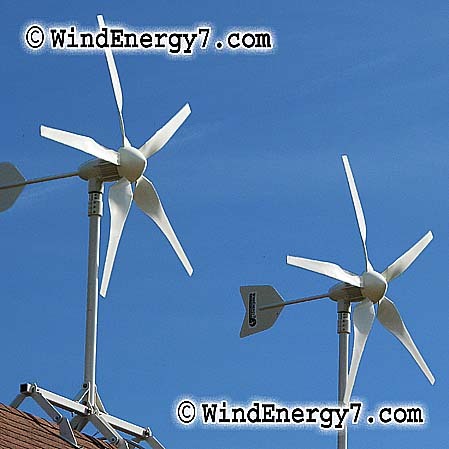 You can buy wind turbines from WindEnergy7 direct, or buy wind turbines from one of our local wind turbine dealers. Buy our patented rooftop wind turbine system with hybrid wind/solar technology. We invented the only rooftop turbine that's safe and quiet for your home. Over the past 2 years, WindEnergy7.com has been forming a customer/dealer & distributor network, involvement is openly being encouraged to all interested. The opportunity is available to customers who have purchased a system to get their local territory. If you buy a system, you can become a dealer with no further investment. There’s a very simple agreement and structure, all win/win. You must be committed enough to Buy a Home Wind Turbine system and learn from us about our wind turbines from direct experience. We take much time and great effort to educate customers and dealers all about wind/solar hybrid technology. Making dealership opportunities available to customers only helps us to focus on those who will know our technology and receive training through their installation. Then we have additional front line support and dealers who know the products and can demonstrate and sell with first hand experience. Many of our dealers become installers or offer installation services and we assist in training them to become installers. The gusts were so strong that my wife could hardly hold her footing to get the last part of the clip. We had free electricity all day long yesterday. The wind storm was awesome. At right you see the quality and durability of our hardware. The heavy duty American Made hardware is so comfortable in a big storm. As you will see by the video we have perfectly balanced and precision manufactured systems. The systems will survive beyond 130mph wind and are built on a 30 year design. These are not toys or plastic prototypes that will wither under the heavy demands of mother nature. To the contrary, the day filmed here at right, this system ran the whole house all day and night without a hitch. FACT 1: Every system ever sold by WindEnergy7.com has been eligible for 30% reimbursement from the IRS, as an IRS tax credit. FACT 2: This year, the tax credit has been improved, paying installation costs, and removing “cost caps”. The year is almost over, so customers are encouraged to start placing orders to take the credit for 2009. These are just a couple of my favorite energy conservation tips for winter. Since you use more heat and lighting during winter months I thought I would release this now to help some folks save energy during the winter. The blades are spinning so fast in about a 10mph wind that the internet video can't really display it well. We used fast speed capture so that the blades would not be just blurry. I real life, watching this in person, you can hardly see the blades at all because they are just a light blur. The best way to do a green energy project for your home is to get a windpower kit of perfectly matched components. Our home wind turbine systems are engineered to work as planned. There are many different sized kits available and most are actually sized according to your budget. FACT 2: This year, the tax credit has been improved, getting additional installation costs of the systems eligible in the IRS tax credits for small wind turbines. Also, new this year, ending Dec 31st is the removal of “cost caps” in the tax credit. So, this year, there is not a limit on how large a system you can buy, install, and claim in THIS TAX YEAR. The year is almost over, so customers are encouraged to start placing orders to take the credit for 2009. Last year there were many orders in Nov & Dec so it’s a good idea to make your move ASAP. The electricians in this video were doing this in two afternoons after hours. The homeowner pulled his own electrical permit. 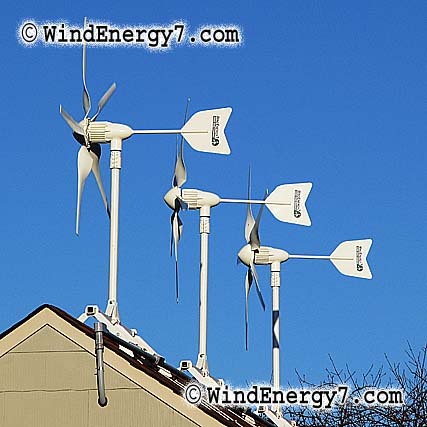 Since the home wind turbine kits are simply an installation of an appliance on a new circuit, no building permit was required. The kits work great and are easy to get on the house and running. What Do You Mean "Grid Tied"
It is a wind solar electric generation system interacting with the utility, with batteries, using the most advanced inverters that can actually sell any excess power produced by your system back to the utility grid. So, today, your meter runs only one way, forward with you paying. With a grid tie, when you are making more than you are using, that meter will run backwards, crediting your account with that power that you generated. It then gets used by your neighbors in their homes from the grid. If you are concerned at all about your utility rates going up and would like to do something to reduce your monthly electric bill, then a grid-tie home wind turbine kit may be just the thing for you. The kits are easy to install, mounted on your roof, where they quietly generate power from the wind sun that you can either use directly or sell back to the utility company. The new HO series system can run on the grid as a "Grid-Tie" or it can run in a rural setting with no grid power at all. The system is very versatile to be able to run as a Grid-Tie or an Off-Grid system. So, if you are interested in the new HO Series turbine here are some links to videos of the system in action, this is a grid tied system and we can still sell you any size that fits your budget in time to take that tax credit. Call me when you are ready to do a pre-sale consultation. [CaRP] XML error: Mismatched tag at line 7 - This appears to be an HTML webpage, not a feed. 18 Apr 2019 at 9:45am --> Over 900 solar panels have been installed for Hildon Natural Mineral Water in a bid to cut its carbon emissions. 17 Apr 2019 at 9:45am --> Solar has helped IKEA to achieve an ?Outstanding? BREEAM UK New Construction Post Construction rating at its Greenwich site. 16 Apr 2019 at 10:51am --> Total UK solar generation soared in Q1 2019 to 2.7TWh, helping renewables to a new quarterly high, a new report has said.